It is clear that safety is the number one priority of SJ DOT and is how the SJ DOT looks at any policy. Moody points out that San Jose’s Vision 0 program is about ensuring zero traffic fatalities, regardless of where a person is (car, bike, sidewalk, etc.). 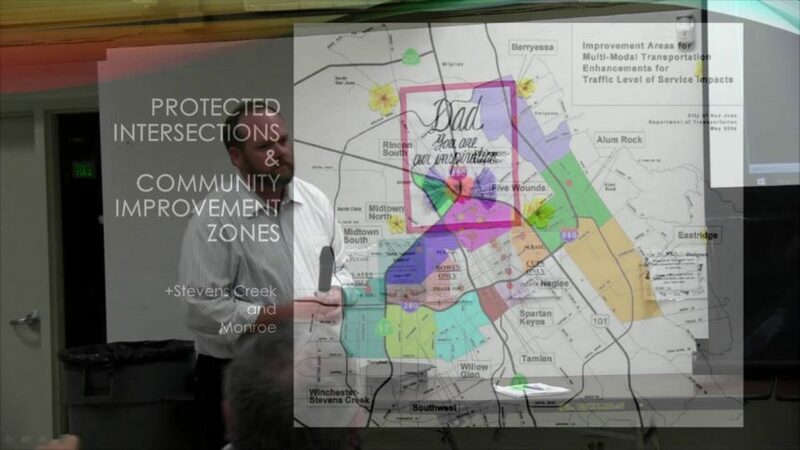 Much of the WNAC falls into a Community Improvement Zone, because of the “Protected” status of the Stevens Creek/Winchester and Stevens Creek/Monroe intersection. The Protected Intersections create *value* that may be used to improve system capacity and/or enhance non-auto travel modes — the distinction between *fees* and *value* is important because, for a number of reasons, it is preferable for the developer to construct the improvements during construction of their project. Note, in a follow-up email, Doug said he had misspoke when he said that San Tomas and Moorpark were a Level F intersection. He meant San Tomas and Stevens Creek.